Apple season here and this Apple Pie Smoothie is a quick and delicious way to make the most of it. All of the flavours of a comforting apple pie in an easy healthy smoothie for a snack or breakfast on the go. All of the taste of an apple pie, with less of the calories. Kids love this apple smoothie too! No, I didn’t throw a slice of apple pie into my blender with some milk – but it definitely tastes like it. That might be an idea for another time – sounds like something I would have made as a student! Instead, we have combined seasonal apples with some nut butter, milk and cinnamon to make an autumn smoothie that the whole family will love. You could add some ginger and nutmeg in there too. Apple pie has to be one of the best desserts out there, so who wouldn’t want a breakfast that tastes just like it, and is healthy too? I am pretty sure that is what dreams are made of. This apple smoothie isn’t just a dream – make it your breakfast reality. 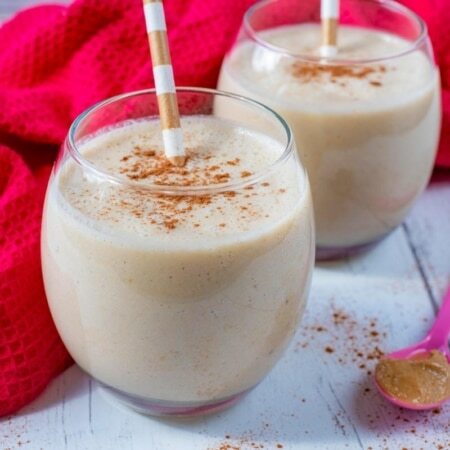 Apple and peanut butter are such a dreamy match, especially when they are in a smoothie. Not just a delicious combo, but they make it super creamy too. You don’t have to use peanut butter, as almond, cashew and hazelnut butter all work really well too. I know I say it a lot, but this is one of my favourite breakfasts as it is healthy and balanced, but it tastes really sweet and indulgent too. I would eat apple pie every day of the week if I could, but that isn’t the most sensible choice, so this is a good way to get those flavours, but in a smoothie. Some people just like something light for breakfast, so this would be ideal. But if you want something more filling, then of course you can have this along side something else. One: Put all of the ingredients into a blender and blend until smooth. We added cinnamon to this smoothie, but give it a real autumn smoothie by using some nutmeg and ground ginger too. You can use any milk you like for this. We found almond milk gave it a real nutty flavour, but dairy milk or soy would work too. The world is your oyster when it comes to nut butters in this. Peanut, almond, cashew, hazelnut – they all go really well with apple. What made a really nice change was using half an apple and half a pear to make a smoothie. Do you want to be kept up to date on more delicious posts like this Apple Pie Smoothie? Please subscribe to the blog mailing list (it takes 30 seconds). 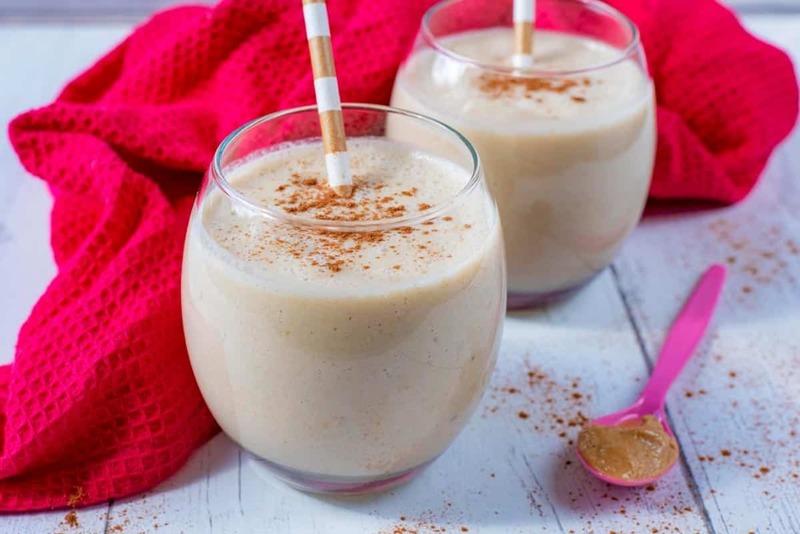 If you’ve tried this Apple Pie Smoothie, or any other recipe on the blog, then let us know how you got on in the comments below, we love hearing from you! You can also FOLLOW US on FACEBOOK, TWITTER, INSTAGRAM and PINTEREST to see more delicious recipe ideas, behind the scenes shots and also what we are getting up to. The world is your oyster when it comes to nut butters in this. Peanut, almond, cashew, hazelnut - they all go really well with apple. I’ve heated the smoothie – and it’s become a very tasty, warm Apple-Pie-Smoothie. Great recipe! Hmmmm! 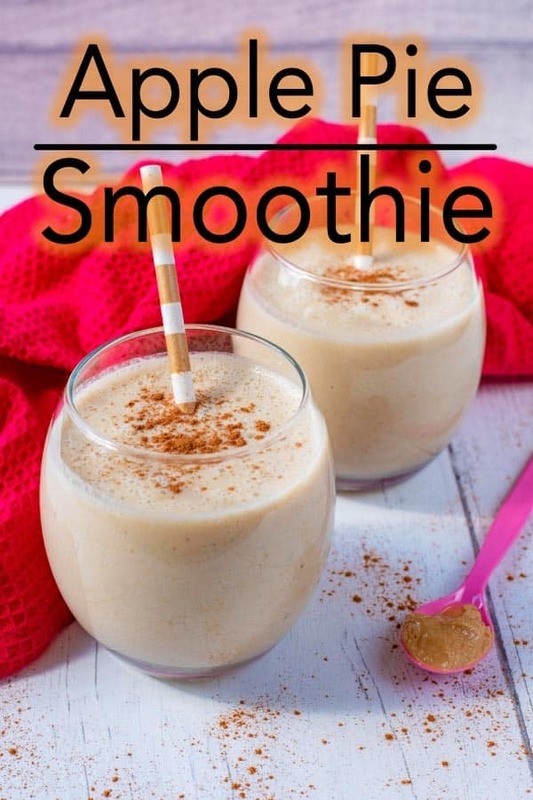 Throwing apple pie in a blender with milk …….. Nope not doing it, sounds good though and your smoothie sounds even better. Sharing it now! I have all the ingredients on hand so will be trying this smoothie! Thanks for the inspiration! This sounds like the best smoothie ever!! What a great idea. I love apple pie too, but you’re right, it’s just not ideal to eat it every day for breakfast LOL! My favorite time of year drinks like this. Looks great! I love apple pie and I start every day with a smoothie so, this smoothie really has my name on it. Going to pin for later!